After receiving SDG Pioneers 2018 award from United Nations Global Compact in New York, Dr. (H.C) Martha Tilaar also scheduled to represent her company, Martha Tilaar Group, to do pledge signing with PT Asia Pulp & Paper (APP) (26/9). The collaboration between two companies will relate to empowering woman that is also become both part concern. Through this collaboration, there will be 1.000 women who who will be trained to identify and manage local herbal plants, to enable community-level entrepreneurship that will create alternative livelihood for them and their family. The target is to reach and train 1.000 women by 2020. Martha Tilaar Grou has started a training center for spa theraphy in Kampoeng Djamoe Organik Martha Tilaar in Cikarang and has provided full scholarship for young womaen from low income families. To date, Martha Tilaar Group has trained more than 7.500 women from varios areas, such as professional therapists, heralthy herbal drinks entrepreneurs and in financial management. “APP is very proud to partner with Martha Tilaar Grou pto empower women within the forest communities. 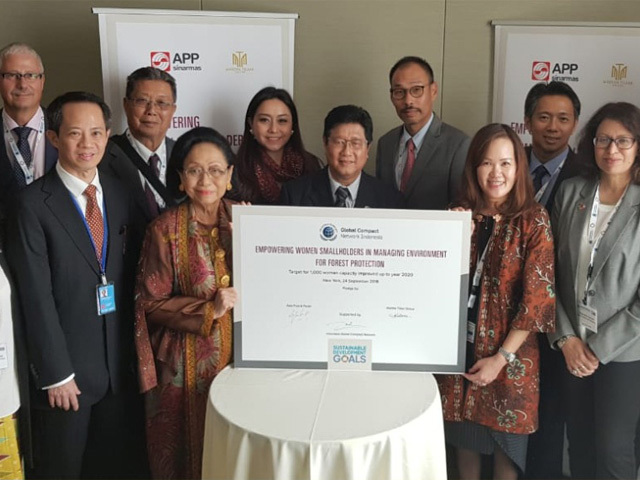 MTG has proven track record of successfully training and helping women in Indonesia to be self-sufficient and this is perfectly complements APP’s mission to censerve natural forests and alleviate proverty,” said Goh Lin Piao, Managing Director of APP. So does Mrs. Tilaar feel. According to her, this collaboration is a good opportunity for MTG to expand its empowerment program amd to reach communities that we previously had no access to. Both companies wish that this collaboration will give good contribution to women’s skill enhancement and proverty alligement. This collaboration is aligned to the UN Sustainable Development Goals, specifically addresing the Goals related to No Poverty, Gender Equality, Decent Work and Economic Growth, and Partnerships for the Goals.